Intended for use only with automated red cell apheresis devices. See Operator's Manual for additional Information and complete usage instructions. Not for direct Intravenous infusion. The pouch is a moisture barrier. Do not use unless solution is clear and no leaks detected. Single use container. Discard unused portion. nonpryogenic fluid path. Rx only. L322, Rev. 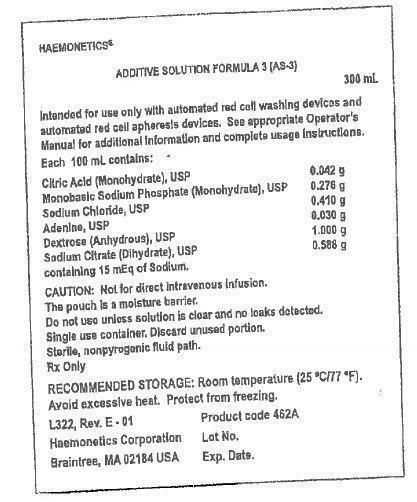 E - 01 Product code 462A Haemonatics Corporation Braintree, MA 02184 USA Lot No. Exp. Date.